To get closer into the heart of Thai-Thai-ness and as a continuation from ‘Tracing the Heart of Thai Animation’, which opened the discussion on Thai animation’s cultural identity and outlined the key feature films in their short history, this post takes a closer look at the source of cultural ideology in Thailand and relates these to the 2006 movie Khan Kluay directed by Kompin Kemgumnird and the sequel Khan Kluay II directed by Taweelap Srivuthivong. There have been seven Thai animated feature films to date with a further 3 in production, mainly seeking to entertain and make audiences happy, rather than challenge them. Thai society is a conservative system where criticism is not common practice. Despite the appearances of military coups and political protests in recent years, there is little evidence of dissent or hidden messages in the animated features, which instead tend to reinforce the ideology. To give clarification of what is meant by ‘Thai-ness’ one can look historically to King Rama V Chulalongkorn (1868-1910) who used the term ‘samakee’ (unity and harmony) as a motto to help define Thai-ness against the (perceived) western encroachment (also see previous blog post for fuller discussion). His successor, King Rama VI Vajiravudh took this idea further developing the tripartite formula of Thai collective identity in an attempt to create the Thai National identity in the form of three pillars of society: ‘Nation, Religion and Monarchy’. In the 2006 feature Khun Klauy directed by Kompin Kemgumnird , and the 2009 sequel Khan Klauy II directed by Taweelap Srivuthivong this sense of Thai national pride is demonstrated in the reading of past historical events and their supporting of the monarchy. The narratives follow the story of an elephant and his role as the war elephant for King Naresuan in the defeat of the Burmese in the Ayutthaya Period of Thai history. Thus the works represent the commonly accepted narrative and do not challenge historical accuracy. 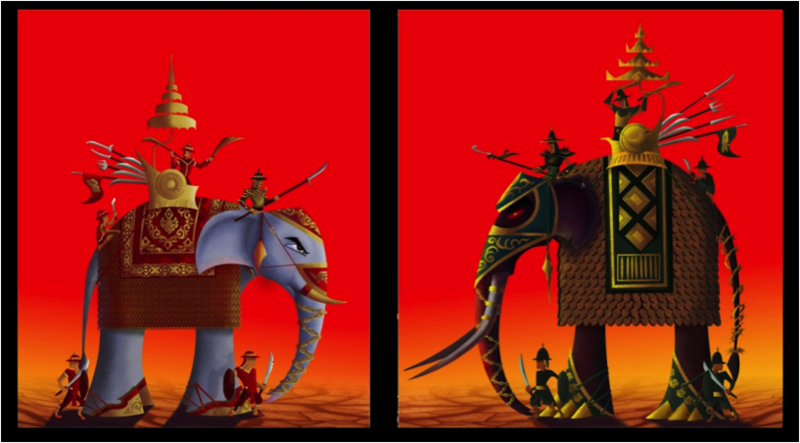 Designs for the Thai and Burmese war elephants Image courtesy of Kantana Studios. Both stories’ narratives also serve to maintain and support the family ideals and reinforce the link between serving family, king and country. A ritual that is still maintained with twice daily renditions of the national anthem, standing for the King before cinema screenings and the King and Queen’s birthdays being the national father’s and mother’s day. The hegemony present in the country to this day continues to support these ideals and can be seen in the unique mannerisms and gestures that make up much of present day Thai life. As noted in a response to a Thai student questionnaire in 2014: ‘Thai people are much more cultural and respectful, respecting older people, leading a simple life, following Buddhism”. Within the films the ideas of karma and respect for elders are seen throughout the narrative, reinforcing the strong social messages. This is a continuation in the unpicking of Thai animation history, trying to set the boundaries to offer future academics a springboard to argue around. It is by no means complete and there is more to come as interviews in the industry unravel more insights into the Thai-thai twisting tale. Millie Young has lectured at Mahidol University International College, Thailand on the Animation Major since 2009. Teaching 2D animation to undergraduate students. Originally from the UK she has taught animation from high school to University since 1992. An animation practitioner, she directed ‘Tally Bloody Ho!’ in 1999 as part of the Arts Council/Meridian TV Taped Up series, winning the Meridian TV award 1999. Thintinan Boonpap (2007) Popular Television and the Construction of Thai Cultural Identity. Doctoral Thesis: Northumbria University. Vella, Walter F. (1978) Chayo! : King Vajiravudh and the development of Thai nationalism. Honolulu : Honolulu University Press. William M. Owens and Wimal Dissanayake (2011) ‘Projecting Thailand: Thai Cinema and the Public Sphere’ Asian Cinema, Fall/Winter 2011. Ingawanij, May Adadol (2007) ‘Nang Nak: Thai bourgeois heritage cinema’, Inter-Asia Cultural Studies, Volume 8, Number 2, June 2007 , pp. 180-193(14).